Is there not a communal aerial system that you can use? I write as a technical bod rather than an expert in RF signals. 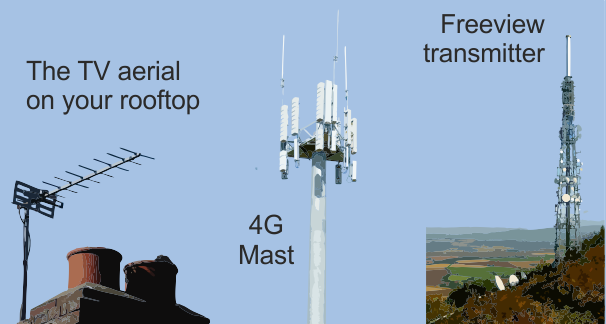 However, being high up there are fewer obstructions, if any, between you and any 800MHz 4G test base stations. Thus the signal is more likely to get to you than at, or near, ground level. My point, therefore, is that whilst one particular "area" may be a bit outside of where they would expect signals to be an issue, the higher you go, the less clutter (objects) and therefore the greater the chance of signals being available (as the ground clutter acts to block or reduce signals). So when defining "area", I wonder if they take into account exceptional dwellings, that are at quite a height. All that said, the TV signal will be very strong. I assume that you can see the Crystal Palace transmitting tower from where the aerial is sited. For this there will be absolutely no requirement for any amplification. Tony: The services you mention as having interference problems are on C26 and C28, which are not frequencies suggested to be most at risk from 4G signal interference. It is possibly worth looking for more usual causes, say an RF modulator on a VCR or Sky box set around C27. Also if you have an HDMI cable or fly leads linking various pieces of equipment, try repositioning them in relation to the receiver to rule out any interaction between them. Cecilia Jones: If either you are using a communal aerial system or two aerials combined on different transmitters, you may have difficulty. Communal aerial systems may need adjustment to allow through the new frequencies for PSB1 (BBC standard definition) and COM5 (Pick TV etc). On your road there are a number of houses with an aerial on Winter Hill (North West) and one on Moel-y-Parc (Wales). This combination may now not be feasible owing to the new lower frequencies of PSB1 and COM5 from Winter Hill. Cecilia Jones: You appear not to be in a good signal area owing to the fact that the signal path is low to the ground for two miles because of the slope upwards. It is also obstructed by the ground in at least two places. There are lots of trees on the slope as well as buildings such as the High School. The other clue are the large aerials on Winter Hill in your locality. There is something on the pole that your aerial is mounted on; a mast-head amp perhaps? Do you have another receiver such as that in-built into the TV that you can try? Cecilia Jones: In addition to that said, if your problem is being caused as a result of the frequency change on April 10th which now requires your aerial system to receive lower frequencies then you can test this out if your You-View box has a manual tuning facility. If it has then go into the tuning menu / manual tune and enter Ch50 (Winter Hills BBC) into the box but do NOT press search or scan, because if the signal is there its level should be seen on the indicator bar, make a note of the level being indicated (if) then change the channel entered to Ch59 (Winter Hills ITV1) likewise noting its level, if the BBC's level is found to be considerably lower than ITV's then the problem is indeed caused by a deficiency in the aerial system, as the signal from the BBC will be sitting under the level required for your You-View box to resolve a picture. By the way, if the aerial is exclusively yours and the difference in levels between the ITV and BBC aren't that terribly much, then in many cases the problem can be resolved by using a booster. Cecilia Jones: Just noticed that I had cut off the bottom of my reply when I pasted it into the reply box. 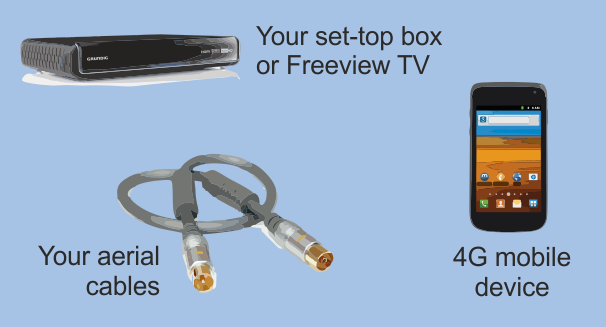 The booster referred to being on page 603 of the Argos catalogue, and either (25) the SLX variable type 534/4235 or (24) the Philex 534 /6130 or if your TV is also Freeview capable then the twin output type 534 / 6147 one output for TV and the other for the You-View box. Of course these items "only" coming into the equation dependant on the signal levels seen indicated and especially the quality of the signal, because if its observed to be fluctuating to any great degree (diving to zero) then boosters will not help in this situation. Jo Dee: I would use a AM (MW or LW) radio powered from batteries. Tune it away from a station and listen for any noise. If the interference starts at a particular time then have it on at the start (and end) time and see if the start and end of the noise on the radio coincides with the TV signal breaking up, that way you know you are listening to the cause. AM radios have a ferrite rod in which act as the antenna. They are most sensitive in the axis perpendicular to their length. Hence, if you hold the radio with it facing you, when the sound is the loudest you know that it is coming from in front of, behind, above, or below you (or somewhere on that axis). Spin round to where it is at its quietest and the source of the noise must be from either end of the radio. Jo Dee: Apart from the advice given by Dave Lindsay, as far as your question about whether their gadgets could interference or not, then yes that's very possible! because Freeview is vulnerable to interference from a variety of sources including modern electronic devices, and although the interference caused by them is not by any means far ranging and rapidly dies off by the metre, being next door virtually means that you are permanently within range.